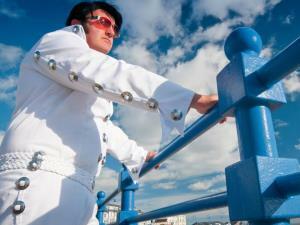 Every September thousands of Elvis fans descend on the seaside town of Porthcawl for a unique celebration of The King. The Official Shows take place in the magnificent Porthcawl Grand Pavilion, one of the best preserved 1930s dancehall theatres in the country. Heat One of the Best Festival Elvis Competition is staged on the Friday afternoon with a new show in the evening to celebrate the Festival’s 15th anniversary this year. ‘The First Kings’ features Elvis Tributes Artists followed by a Headline performance by last years’ Best Festival Winner, Rob Willis. Heat Two, followed by the Grand Final, are staged in one show on the Saturday afternoon. The Elvies – the World’s most prestigious award show for Elvis Tribute Artists – takes place on Saturday evening. Three shows are staged on Sunday starting with the ever popular Elvis Gospel Show, followed by Elvis Orchestrated – American ETA Kraig Parker performing with the 20 piece Cardiff Philharmonic Orchestra. The Festival concludes with our traditional Trilogy show featuring three ETAs performing Sun Studio, ’68 Special and Vegas sets. M4 Junction 37 & A4229.